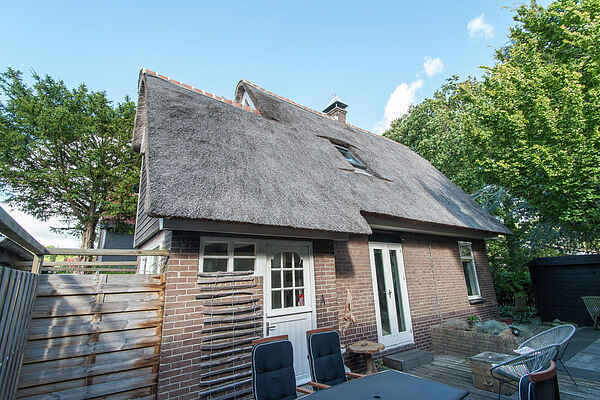 This detached, thatched house is a 10-minute walk away from the town of Bergen in the province of Noord-Holland and a 20-minute bike ride away from the beach of Bergen aan Zee. The holiday home has a wonderful terrace and the fence in the garden ensures total privacy. There is a small and cozy living room on the ground floor. The separate kitchen has all the modern comforts. The house is nicely decorated and you'll immediately feel at home here. Bergen has plenty to offer. The beach, forest, dunes, polder region and charming villages are the main attractions. In the direct vicinity you will find plenty of cycling and walking options to various lovely sights. There are two polder mills from the 16th and 17th centuries, on the Meerweg and on the Voert, both worth visiting. The same applies to the sea aquarium in Bergen aan Zee. North of Bergen are the Schoorlse Duinen. This region has the highest and widest dune area in the Netherlands, up to five kilometres wide. There is also the option to go to the movies on the beautiful estate \"het Oude Hof\" (Cinebergen). Alkmaar, city of a thousand cheeses, is nearby.